Amazing Gmail Tricks that will make your a Gmail Genius thereby improving your productivity. Gmail has several trump cards in its sleeve that you probably did not know about. The popular email service is capable of much more than just sending and receiving letters. With its predefined commands, options for customization and other useful tricks, you can optimize your work with the mail much more efficiently. There are always people who abuse the "Reply to all" function and use it for other purposes, responding to one or more group correspondents. When one of these clever people is discussing something with others, the incoming emails from everyone else begins a real mess. So to get rid of these dumping notifications, to which you do not care, is very simple. Click on the three verticle dots towards the top and then select "Mute". Messages will be received only without distracting notifications. And just in case if you plan to Unmute them later then you can do so by typing 'in: mute' (without inverted commas) in the search bar and then selecting on the 'Unmute' option from the drop-down menu. Did it ever happen to you that you sent a mail to person and just after few seconds you realized that you had incorrectly indicated the addressee? Sending a letter to the wrong address can be fraught with serious consequences. Fortunately, there is a way using which you can overcome this critical situation. Go to the "Settings" and then in the "Undo Send" section of "General" tab, select the time period, during which you want to have such an opportunity of canceling the sent message. So, the next time when you type in the message and hit the send button you will see a small pop message towards to bottom left-hand side of the window with a link "Undo", clicking on this link you can cancel your already sent message. Most importantly - do not forget to click the "Save Changes" button at the bottom of the page. It turns out that to work with letters in a Gmail box, you do not have to be online. Gmail allows you to read and reply to messages, search and archive the necessary correspondence without access to the Internet. 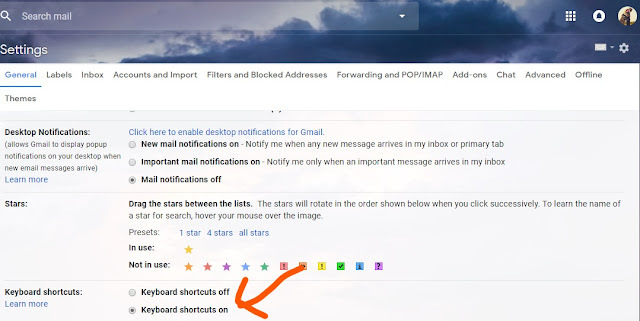 However, to take advantage of the 'Gmail Offline', the extension must be installed with an active Internet connection. Go to the already familiar "Settings" menu, select the "Offline" tab and make the installation. In a few minutes, the extension will synchronize and download your emails, so that the absence of the Internet does not interfere with the mail. To save time, use hotkeys. Again go to "Settings" and in the "General" tab we enable this function. Now you can rummage in your inbox, without touching the mouse. Perhaps you do not want to send a letter late at night or are afraid that you might forget it in the morning. The expansion of Boomerang for Chrome will help plan the sending of a pre-prepared letter according to the schedule and remind you of the postponed mail. If you do not want to reply immediately but are also afraid that you might forget to write the answer, use the "Tasks" list. 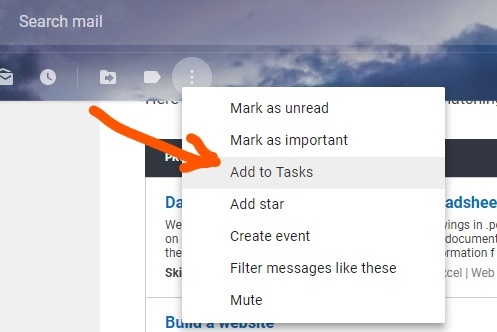 To add a reminder about a message to Tasks, select the incoming message that you want to reply to, then click the More button above it and select Add to Tasks. 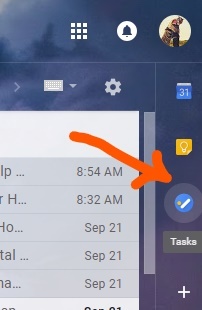 To check if this task appears in the list, go to the upper right corner of your Gmail window and click on the "Tasks" button. There, you will see your list of pending tasks. If you receive many emails from online stores or newsletter services and do not want to miss out on profitable offers, there's a good way to filter out the messages you need. Click on the small arrow which towards the right-hand side of the search bar. A window will appear in which you need to enter conditions for filtering letters (by subject, sender, recipient, etc.). Having specified the necessary parameters, click on the "Create filter" in the lower right corner of the window. Did you know that you can send messages from different addresses without leaving your Gmail account? To do this, go to the "Settings" menu, go to the "Accounts and Import" tab and in the "Send Mail As" section, click on "Add another email address". A new window will open where you can attach another email address to your Gmail account. To find out whether the email was addressed only to you or to the mass mailing list of mailboxes, turn on the function of "Personal level indicators"
Go to settings, select the "General" tab, then select "Show indicators" in the section "Personal level indicators". Now in the Inbox you will see an arrow next to the messages sent to you along with other recipients, and a double arrow next to messages that are only addressed to you. There is a very simple way to collect all letters and contacts in one mail account. Go to the already familiar "Settings" menu and select the "Accounts and Import" tab. In the "Import mail and accounts" section, click on "Import mail and contacts" link which will open a new window with instructions that you can follow to collect all your mail and contacts in a single Gmail account in minutes. The Checker Plus for Gmail extension for the Chrome browser will send notifications of new emails, and will allow you to read and delete incoming messages without opening the Gmail page. In a world where online profiles are constantly threatened with hacking, you need to be sure that your account is secure. To know that no one but you is wooling the Inbox, check your recent account history. Click on the "Details" link which is displayed in the lower right corner of the screen. It will then open a new window with information about all activities in the current account and associated active sessions. Gmail is so universal tool that for many it has long crossed the narrow scope of just a mail client. However, sometimes it can lead to a gradual accumulation of too many emails most of which are not required. So now I'll teach you how to easily filter the list of emails that you can delete easily. 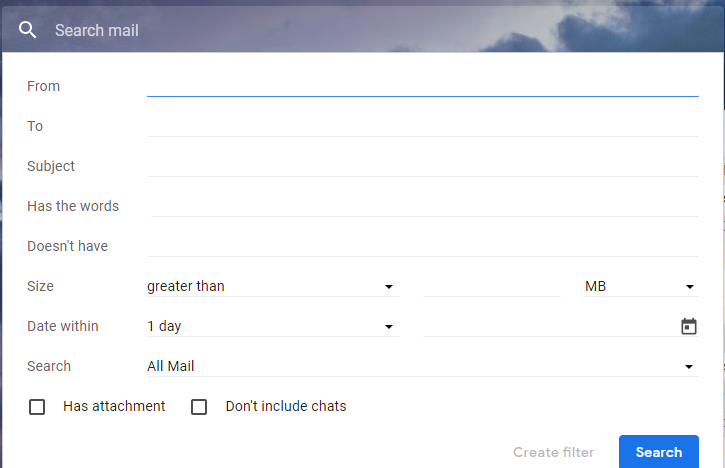 in: inbox - search for messages in the inbox. in: sent - search for messages in the folder sent. in: trash - search for messages in the trash folder. is: impotant - search for letters in the important folder. You can change the parameters such as folder and dates as per your requirement. e.g. (in: important after: 2015/07/4 before: 2016/04/12) and so on. 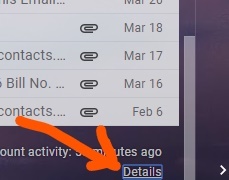 After you enter the above command you will see a list of emails for the defined time period. Here "10m" specifies the file size of 10mb. By this command, Gmail will show you the list of emails that contain files equal to or greater than 10MB. There are situations when you need to delete all emails from the inbox, for a certain period, and size. 1. Open your mailbox, type "in: all" in the search bar and click on the find button. 2. You will see a full list of all your emails. 3. Select the emails you wish to delete and then click on the delete button. I described the most useful commands that I used myself. With their help, you can very quickly clean your mail from unnecessary emails. I hope that with these tips, you will be able to use Gmail much more efficiently than before.